Howard was a portrait and history painter who was a close friend of Soane. He started studying with the painter Philip Reinagle in 1786 and from 1788 was a student at the Royal Academy Schools where he was awarded a silver medal for life drawing and then the gold medal for history. He became a full member of the Royal Academy in 1808 and exhibited there until his death. In 1811 he became Secretary of the Academy and in 1833 he was appointed Professor of Painting. During the 1830s when Soane's failing sight prevented him from delivering his Royal Academy lectures, Howard read them for him. Amongst Howard's works are portraits of the sculptor of this bust, John Flaxman, Professor of Sculpture at the Royal Academy, and his wife Anne (National Portrait Gallery NPG 674 and 675), painted c.1797, perhaps at around the time that this terracotta was modelled. 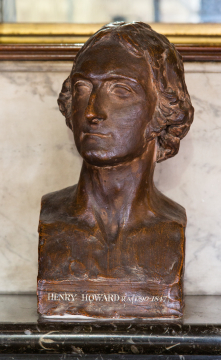 This bust of Howard is placed on the mantlepiece in Soane's Breakfast Room in such a way that it looks towards his painting of The Contention of Oberon and Titania (Soane P152) and through a doorway towards his ceiling paintings in the Library Dining Room (Soane P1-7).